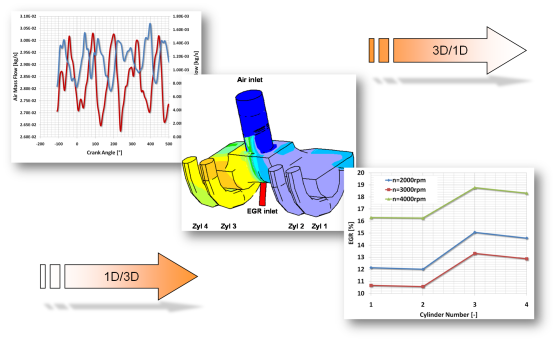 In 1D/3D coupled computations the benefits of both tools can be combined. Entire engine simulations together with locally resolved 3D phenomena are simultaneously performed. In such a simulation the codes exchange boundary conditions interactively during the entire simulation duration. The results obtained by one of these codes are incorporated by the other code in this way. As an example, this procedure can be used to optimise the EGR distribution in the intake manifold to obtain a homogenous EGR/air mixture. If in addition a phenomenological combustion model is used in the cycle simulation tool, the impact on combustion behaviour and emissions can be examined.